Atletico Madrid booked their spot in the Europa League final with a 1-0 win (2-1 on aggregate) over Arsenal on Thursday evening, securing their third European final in five years. Despite the Gunners seeing the majority of possession throughout the evening, yet another costly defensive error brought an end to Arsene Wenger's dream Lyon send-off as Diego Costa's solitary finish on the stroke of half-time was enough to see the Spanish side through. Los Rojiblancos will meet Marseille in France on 16 May after they beat Red Bull Salzburg 3 on aggregate after extra time. An ear-splitting Estadio Wanda Metropolitano looked on in anticipation ahead of the season-defining contest, with both sides' silverware aspirations hanging on the second tier of European football. And the hosts had the chance inside the opening five minutes to hand themselves a dream start and take one step closer to Lyon with Diego Costa bulldozing his way through the Arsenal defence; leaving him one on one with David Ospina. However, the 29-year-old, fresh back from overcoming the hamstring injury that had seen him sidelined since the quarter-finals, blazed his effort wide of the Gunners' upright from a tight angle after failing to coax the Colombian custodian into making any premature movement. Looks like a serious injury for Laurent Koscielny. What a shame in a big game like this and just 6 weeks before the World Cup. A prolonged stoppage in play swiftly followed as Laurent Koscielny was eventually stretchered off after a somewhat innocuous incident which saw the Frenchman appear to turn his ankle before crumpling to the floor in pain - ​causing concern for the 32-year-old's World Cup chances after it was confirmed the defender had torn his Achilles. But Arsenal's unfazed reaction to the incident, despite missing their captain, was a positive one, as Alexandre Lacazette was afforded the opportunity to potentially break the deadlock before the half-hour mark after being slipped in behind the Atleti defence. However, Los Rojiblancos' back four did enough to force the Frenchman wide and quash any danger. Although, not long after, it was the Spanish capital outfit's turn to offer the Gunners' bench a hearts-in-mouths moment as Antoine Griezmann flashed inches wide after a smart touch afforded the attacker space inside the north Londoners' area. 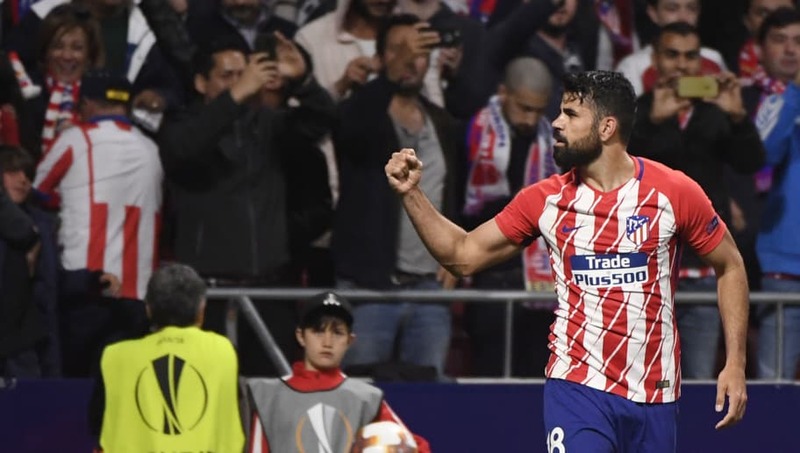 But Diego Simeone's side's pressure, which had continued to mount as half-time approached, eventually told with a minute remaining of first half stoppage time as Costa made no mistake second time around one on one with Ospina to fire ​Atletico Madrid into the lead. The former ​Chelsea striker, similarly to Lacazette earlier in the half, was fed with a well-timed through ball into the opposition area. However, unlike the Arsenal man, the Brazil-born frontman was able to get his shot away and almost took the roof off the Metropolitano in the process, as his effort flew past the Gunners' goalkeeper; leaving Arsene Wenger with a very difficult team-talk as Italian referee Gianluca Rocchi brought an end to the first 45. After the break, the visitor's increase in urgency was evident, and five minutes into the half Aaron Ramsey was found six yards out from a free-kick, but the Welshman struggled to control possession and was unable to apply any purchase on the bouncing ball, which eventually trickled wide after clipping the 27-year-old's knee. But the north Londoners' early dominance dwindled alongside the minutes, as Costa continued to prove the difference with his overpowering strength, which almost provided the catalyst for Griezmann putting the tie to bed before substitute Callum Chambers' goal-line block kept ​Arsenal in it. However, the defender's efforts were not enough to keep Wenger's dream alive as a dogged Atleti saw out the remaining time to reach their third European final in five years and set up the potential for a Madrid double ahead of ​Real Madrid meeting ​Liverpool in the Champions League final. Here are the 1⃣1⃣ ATLÉTICOS who are going to defend our colours from the start in tonight's #UEL semi-final!